Sephora has a new promo! 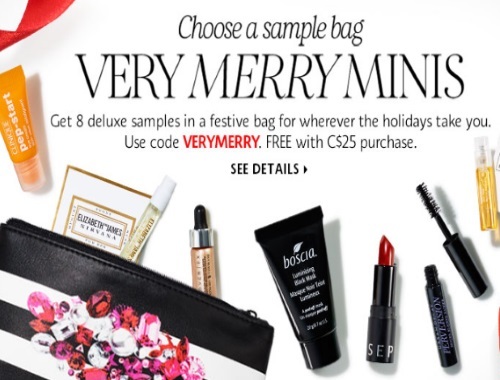 Get 8 Deluxe Free Samples in a festive bag for whatever the holidays take you with any $25 order online! There are 4 sets to choose from: A Mid-Flight Delight, A Soiree at Home, Luxurious Late Night or A Weekend Treat (I picked this one because I wanted to try the Sunday Riley Water Cream). Enter the promo code VERYMERRY at checkout. Offer available while quantities last.